Lord Muneshwara is a deity worshipped by Hindus in India. In the name of this deity, there is “muni” meaning saint and “ishwara” meaning Lord Shiva. Literal meaning of Muneeshwara is Lord of Sages. This deity is worshipped as a form of Shiva. 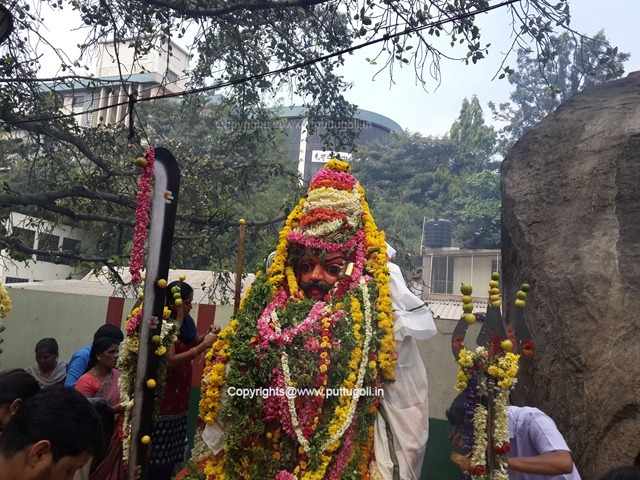 Other names of this god is “Muneeswaran”, “Muneeswarar” and “Lord Muneswara”. 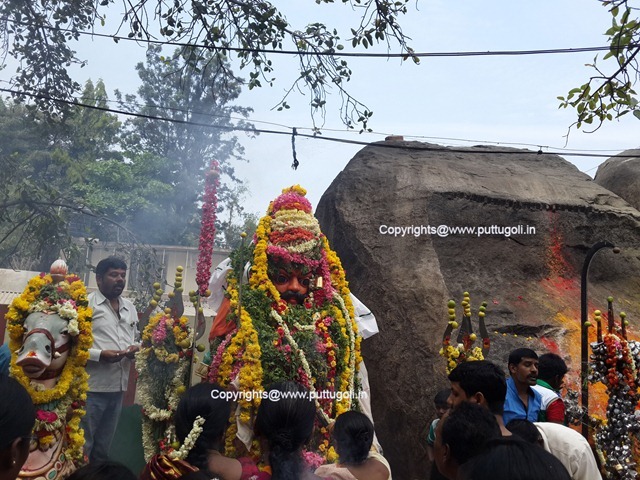 This temple is situated in Hosur road near Christ University and NIMHANS. There is no temple constructed for this deity. 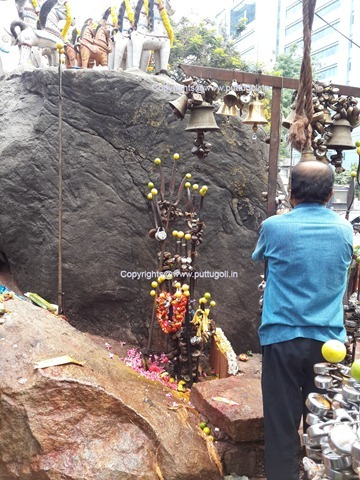 Around 3 feet height idol of Lord Muneshwara is installed on a rock. It also is surrounded by two big rocks. It is very common in Indian temples that the devotees offering flowers, sweet, and fruits to god. In some of the other temples deity is offered goat, sheep, and chicken. But in this temple, devotees believe that Lord Muneswara likes “cigarettes, liquor, and Chicken” very much. But some of the devotees offer “Sweet Pongal” ( a recipe made of rice, ghee and jaggery) and “Curd Rice” to Lord. Here, we can see the devotees themselves offering flowers and food articles to Lord without any priest being present. 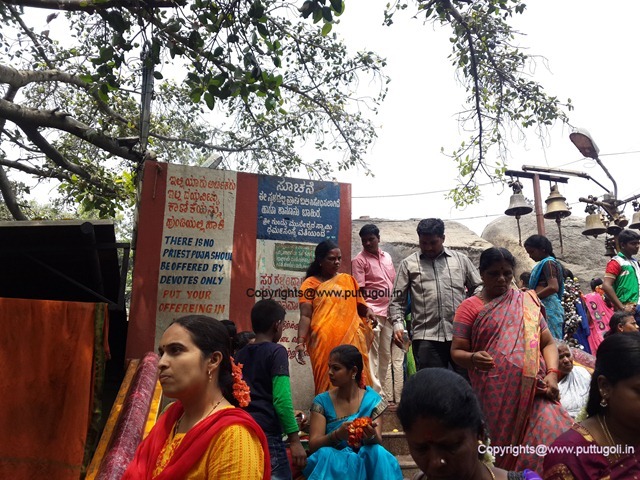 There is a sign board saying “offering animal sacrifice” is prohibited and a CCTV camera is present to capture any such acts. Still the devotees offer the animal sacrifice to Lord!! of course not in front of the camera. In India there are many NGOs for opposing animal sacrifice in Hindu temples. I agree that in many ways sacrificing animals is not acceptable but if the people from other religion slaughter animals (such as goat, sheep, cow and camel) during festivals is also not acceptable. But these NGOs target only Hindu temples. Also, slaughtering animals in butcher shops and meat export houses is completely accepted. This is the height of hypocrisy in India. 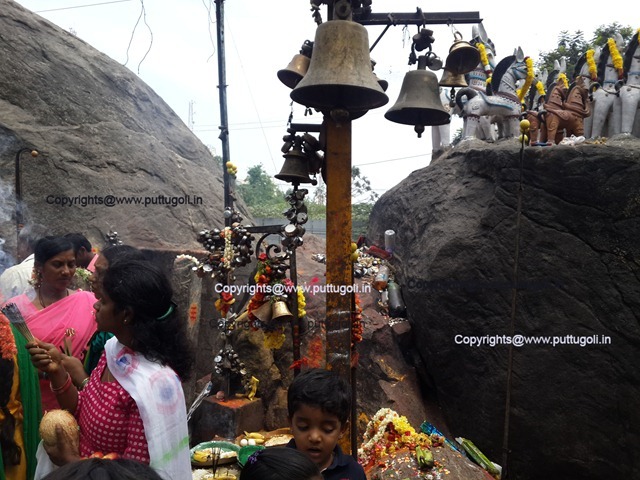 Devotees take religious vows (“harake”) in front of the Lord and put a lock as we see in the below picture. This is done in order to get the blessing of the Lord. Once their wishes are fulfilled they are supposed to come to the temple and offer the sacrifice (e.g. animal sacrifice or any other food articles such as “Sweet” or “Curd Rice”). 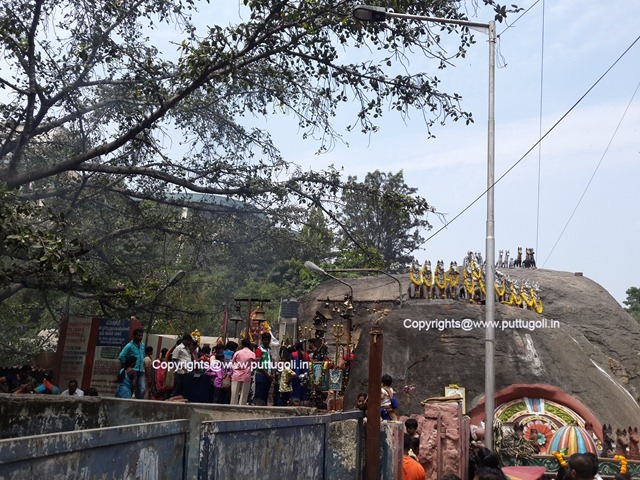 Nearby the Lord, there are wood burning stoves where the devotees cook the food and offer to the deity. As per the Hindu religion consuming the food offered to the deity cleanses one’s body and mind thereby preparing for spiritual growth. The animal offered as sacrifice are sprinkled with holy water so that it will get a good re-birth (punar-janma). And the animal sacrifice is done with sharp axe and cut in a single blow hence shortening the “process of dying”. Devotees come here from distant places. It is believed that the Lord Muneshwara helps them getting rid of many of the troubles they face in their lives. Usually on Sunday the temple is filled with devotees. This miraculous temple is present in Bangalore, India. From Majestic: Catch any bus going towards Electronic city and get down at Christ University near dairy circle. From other parts of Bangalore: Get busses going towards “Dairy Circle” and get down at Christ University.